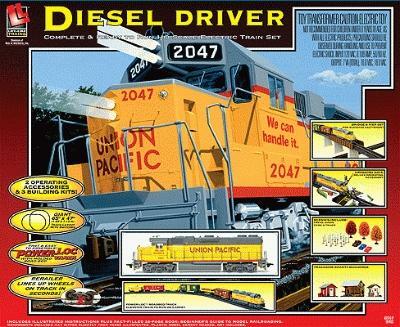 This is a Diesel Driver Union Pacific Model Train Set HO Scale from Life-Like Trains. Retail $230.99 SAVE 24% ! A Union Pacific GP38-2 diesel locomotive with working headlight pulls a wood-brace boxcar, 2-bay hopper, steel door boxcar, stock car, log dump car with logs and matching 8-wheel caboose around a 65 x 47 1.65 x 1.19m Power-Loc track layout. Accessories include an 18-piece bridge and pier set, 3 trackside shanty building kits, operating log dump, operating crossing gate 2 switch tracks, 3 trees, 2 cars, 1 truck, figures, mountain paper, 19 railroad signs, 6 utility poles with transformers and call boxes plus a pair of extra couplers, illustrated instructions and a copy of "Beginner's Guide to Model Railroading". Sets also include a UL-listed power pack with forward and reverse and a terminal rerailer.